There are loads of ways one can get hired. Sometimes you go through it with a job agent, sometimes through Linkedin, sometimes via creative resumes. Finding jobs is not easy, so 28yr old Carrie Kemeling decided to attack the process a little differently. Instead of contacting consultants or cold-calling recruiters, she decided to take matters, and her resumes into her hands, hoping to pass them to others’. And that she did. 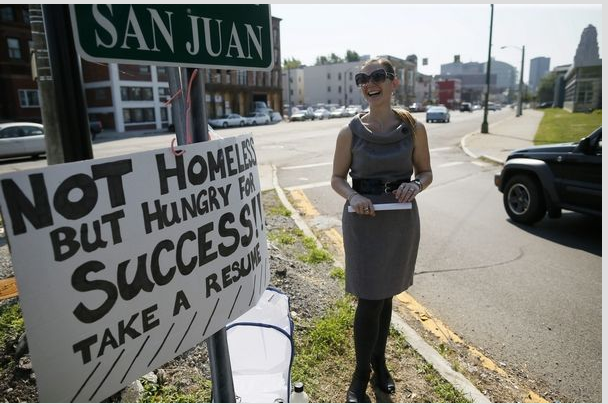 Armed with a cardboard signboard, and a stack of resumes, Kemeling stood by a busy exit ramp off a highway in Buffalo, New York, handing out her resumes to whoever would take them. “I’m just trying to get my word out to as many people as possible to show my creativity and innovation, and you know hopefully, I can find something that will make me happy. If people can give money to somebody who is homeless and not looking for work, they can also help someone who is trying to help themselves,” she said. “I believe this is going to be a success story. People want to see self-motivation. And I’m not giving up on myself and never will.” she told Buffalo News. Kemeling had worked as a sales representative at a local jewelers, and had put down her papers only a day before this stunt. Apparently, Kemeling quit her last job because she was passed for promotion.